Ben Pope bagged a double for Burgess Hill Town in their 3-2 away defeat to Brightlingsea Regent on Saturday. Picture by Chris Neal. 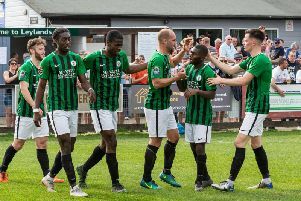 Burgess Hill Town boss Simon Wormull revealed that Saturday’s 3-2 away defeat to Brightlingsea Regent in the Bostik Premier was the first time he had doubted his players effort and desire since he took permanent charge of the club. Hill took the lead through Ben Pope but Josh Gould struck back for the Rs. Aaron Condon’s second half strike put the hosts in front before he added his second and Brightlingsea’s third. Pope netted a late consolation but the Hillians couldn’t find an equaliser as they fell to their third consecutive league defeat. Wormull said: “Saturday was not a good day at the office. It was a difficult game because of the weather conditions and it was a long journey. “They were a very direct side but we didn’t get ourselves going. Although they weren’t the greatest side in the world we just didn’t impose ourselves at all. “It’s the first time since I’ve been here that I doubted their effort and their desire to put the work in which was a shame." Hill took the lead on 34 minutes as Tom Cadman robbed the ball off the Rs Ricky Griggs and he squared it for Pope to score. The lead was to only last three minutes as Gould tucked home after an in-swinging free-kick. As the second half began Hill looked bright, as Aaron Smith-Joseph’s acute attempt agonisingly rolled across the line. However, the hosts went ahead on 57 minutes as Condon jinked through the Hillians defence before slotting past ‘keeper Josh James. Condon then doubled the advantage on 79 minutes as he cut inside and shot to beat James. Hill began to throw everything at the Rs and were rewarded as a long-range free-kick on 90 minutes found Pope who duly finished from seven-yards out, before the full time whistle blew. Wormull added: “Again it was three individual mistakes that contributed to the goals. We’re not chopping and changing formations, we’ve kept to what we did in the first days that I took over in caretaker charge. “What I think it is at the moment is that individuals aren’t concentrating and we’re getting punished for our mistakes. It seems to be that any time the opposition makes mistakes we don’t capitalise on it. “You look at it on Saturday and they had four shots on goal and scored three and that tells a story." Hillians: James, Choules, Cadman, Wilson, Elphick, Richmond, McCollin, Harding (Galach 76), Pope, Deacon, Smith-Joseph. Unused: Bennett, Kipeya, Short, Bromage.